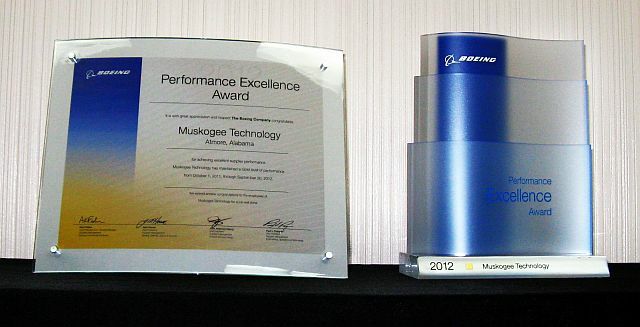 Muskogee Technology announced today that it has received a 2012 Boeing Performance Excellence Award. The Boeing Company issues the award annually to recognize suppliers who have achieved superior performance. Atmore, Alabama- April 23, 2013- Muskogee Technology announced today that it has received a 2012 Boeing Performance Excellence Award. The Boeing Company issues the award annually to recognize suppliers who have achieved superior performance. Muskogee Technology maintained a Gold composite performance rating for each month of the 12-month performance period, from Oct. 1, 2011, to Sept. 30, 2012. This year, Boeing recognized 594 suppliers who achieved either a Gold or Silver level Boeing Performance Excellence Award. Muskogee Technology is one of only 153 suppliers to receive the Gold level of recognition. Muskogee Technology supplies manufactured aerospace products to Boeing for its Network & Space Systems and Boeing Military Aircraft divisions. Muskogee Technology has been providing high quality products to Boeing for over six years with the highest level of success. The Boeing Company and Muskogee Technology signed a Mentor/Protégé agreement back in 2006 in which technology and training was transferred to assist Muskogee Technology to reach this high level of performance. Muskogee continues today providing many of these machined and fabricated products through long term contracts. For more information on the Boeing Performance Excellence Award, visit www.boeingsuppliers.com/recognition/. Muskogee Technology provides a variety of services to meet the needs of the aerospace and defense industries including metal fabrication, precision machining, water jet cutting, electronics, engineering and providing electronic and electromechanical assembly and kitting services. Muskogee Technology is owned and operated by the Poarch Band of Creek Indians. Alabama. It is a sovereign nation, with its own system of government and jurisdiction. The Tribe operates a variety of economic enterprises, which employ hundreds of Tribal Members and area residents. Creek Indian Enterprises Development Authority, the economic development arm of the Tribe, manages the following businesses: Magnolia Branch Wildlife Reserve, Muskogee Inn, Perdido River Farms, Creek Smoke Shop, Creek Travel Plaza, and Riverside Smoke Shop. The Poarch Band of Creek Indians is an active partner in the State of Alabama, contributing to economic, educational, social, and cultural projects benefiting both Tribal Members and residents of these local communities and neighboring towns. The Tribe’s Planned Giving Campaign includes significant donations to local schools, education scholarships, senior centers, youth athletics, and charitable organizations.